it's in great shape to play. 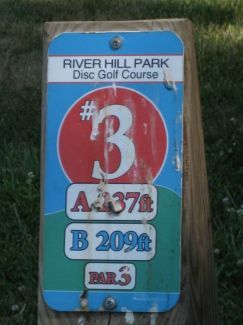 Description: Friendly course in a multi-use public park with moderate traffic. Designed for beginners and recreational players. Mostly short, technical holes which weave into and out of woods with minimal underbrush. Local Directions: From the intersection of Tates Creek and Man-o-War, go east (toward Hamburg) and take your first left (Crosby Drive). The park is immediately on your right.